A masterpiece of sophistication and culture inspired by the delicate and irresistible balance of bitter-sweetness. Rare Amber and precious woods mingle fluidly with the sweetness of jasmine and honey. An intoxicating potion that reveals the complex and mysterious essence of Lady Mary. Oriental, amber. An ode to Lady Cora! Celebrating her devotion to family and her innate grace and beauty. "Grace & Devotion" is refined, classic, spirited and unforgettable with enchanting neroli, inviting jasmine tea and sensual musk. Gourmand vanilla. Modern, chic and glamorous! "Elegant Flourish" is a striking homage to the evolution of Lady Edith and to liberty itself! Alluring cherry blossom embraces jasmine and black cherry with a finale of lavish tonka bean and amber; Avant-garde enchantment. Floral, fruity, musk. Charming and romantic with noble character! "Anna's Romance" incarnates her gracious nature, quiet strength and beauty. An irresistible blend of black cherry and bitter orange marmalade mingled with the sweetness of vanilla and honey. Oriental, vanilla, fruity. Sparkling with life and loveliness! "Demure" captures the radiant spirit of Lady Rose with breathtaking Rose de Mai and vanilla orchid mingled with soft musk. Delicate, sensuous, yet innocent and full of life! Oriental floral, rose, powdery. Refined and cultured, "Aristocrat" immortalizes the incomparable Countess Violet. A symphony of velvety orris and smooth orchid with a spark of pink pepper finishing with a rich base of rare amber and sandalwood. Divine! Oriental, woody, spicy. Daisy Mason -- "Honestly Daisy"
Pure, honest and youthful with a warm heart! Fresh as the springtime brimming with floral delights, embodies the beauty of youth and the captivating, open nature of the beloved Daisy Mason. Floral, white flowers, musk. 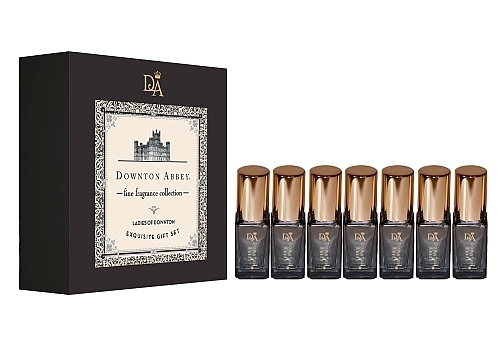 Downton Abbey Fragrance: Ladies of Downton, "Exquisite Gift Set"
For those who can’t choose one, like me, the entire collection Ladies of Downton Exquisite Gift Set! Receive all seven exquisite perfumes, each in an elegant 4 ml. roll-on. Perfect for purse and travel ($244.99, Shoppbs.org). Note: "Downton Abbey Seasons 1, 2, 3 & 4” are now available on DVD and Blu-ray Click here to shop! Who is your favorite Lady of Downton Abbey? Leave your comment below!